Since The Great Recession, investors looked to support from the Federal Open Market Committee (F.O.M.C.) during periods of stock market weakness. They particularly looked to the F.O.M.C. to re-emphasize their very accommodative monetary policy during periods of such weakness — the so-called Fed put. Their reassurance came from strong forward guidance issued in F.O.M.C.’s statements following their monthly meetings. In addition, the Fed chair’s quarterly press conferences added nuances to those quarterly meeting statements. In a recent speech, the Cleveland Fed President, Loretta J. Mester, said “….the F.O.M.C. used forward guidance about the expected future path of interest rates as a policy tool. We conveyed that our future path was going to be very accommodative for a long period of time.” The F.O.M.C. now appears to be pulling back from that policy of strong forward guidance. New York Fed President, John C. Williams, recently stated that in light of the “humming” economy and interest rates well above zero, “the case for strong forward guidance is becoming less compelling.” Finally, Fed Chair Jerome Powell said, “forward guidance was highly useful in the crisis; I think it will have a significantly smaller role going forward.” Not only will forward guidance play a smaller role but also it will do so with fewer words (see Figure 1). During the past period of unusually low interest rates, the ultimate upward direction for rates seemed obvious to both the F.O.M.C. and investors. Since December 2015, the F.O.M.C. gradually increased the Fed Funds rate as it moved to normalization. By the end of 2019, the F.O.M.C. should reach its goal of a more normal monetary policy. At that point, the F.O.M.C. will face greater uncertainty in determining whether interest rates should go up, down, or remain unchanged. As a result, the smaller role strong forward guidance will play in F.O.M.C. communications reflects this uncertainty. With this change, investors will be more on their own when considering future Fed policies. Those with investment experience pre-dating The Great Recession will see this shift as a return to the norm. On the other hand, this will create an important shift for those whose principle experience came during the period of the Fed’s unconventional monetary policies. 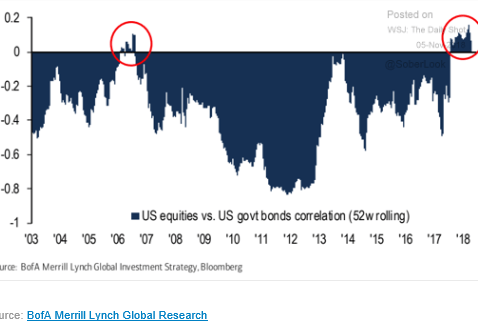 For some years, the changes in bond and stock prices have tended to be negatively correlated. This manifested itself by offsetting price movements between these two asset classes (see Figure 2). Therefore, such offsetting price movements tended to cushion the classic portfolio mix of 60% equities and 40% notes/bonds from excessive financial market volatility. Figure 3 gives a different picture of the same change by comparing stock and fixed income price movement two years apart — 2016 vs. 2018. The Wall Street Journal recently pointed out the very different nature of the F.O.M.C. statement after their recent November meeting when compared with 2016. At that time, the F.O.M.C. delayed its rate increase strategies for nearly a year. They did so, in part, to reflect their concerns about downside risks to the economy and financial markets. Today, their concerns, instead, reflect the economic strength, particularly, the historically low unemployment rates. At the same time, the F.O.M.C. 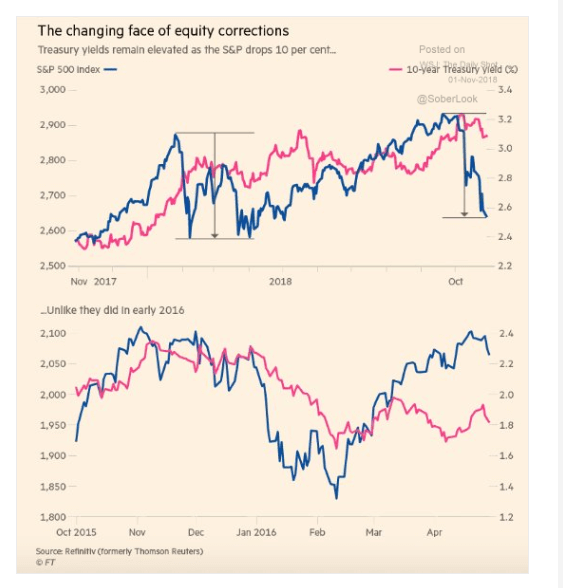 showed no concern in their November statement with recent sharp declines in the equity markets. With the absence of strong forward guidance, investors can no longer depend on the Fed to provide direction and liquidity — the Fed put — that supported the strength of both equity and debt markets since The Great Recession. As we look into 2019, the economy will likely see continued regular Fed Fund rate increases through most of the year. At the same time, the economic stimulus from both fiscal spending increases and tax rate cuts will gradually ebb during the first half of next year. With the gradual absence of this tailwind, economic growth rates will likely become more subdued in the latter half of 2019. Two caveats seem necessary for judging the economic and investment outlook for 2019. First, typically, seasonal adjustments of first quarter G.D.P. estimates show greater distortions than for the remaining quarters of the year. Therefore, if the past proves true again, first quarter G.D.P. numbers will provide only modest economic guidance for the rest of 2019. The second caveat is the known unknown represented by the eventual outcome from the trade war. With this economic background, we continue recommending portfolios with an equal representation of equities, short duration fixed income securities, and alternatives. As 2019 progresses, we expect to see changes in our recommendations to reflect the timing of a potentially more subdued economic outlook.